Bristol is always worth a visit. In 2017 it was named by the Sunday Times as the best place to live in Britain: “a small city that feels like a big city”, it was praised for being “handily placed for seaside and scenery” but “hardly cut off”. A little less than a year ago I went to the north of the city to see Latics get a 1-1 draw against Bristol Rovers in primitive conditions, sitting under a canopy with the rain lashing in at the rustic Memorial Ground. The impressive Ashton Gate stadium is some three miles south of the city centre, not far from the iconic Clifton Suspension Bridge. Bristol City were in fourth place, following fine wins at Sheffield United and Middlesbrough, facing a Wigan team low on confidence and in a relegation dogfight. Gary Caldwell’s promoted side played there in the opening game of the season in August 2016, going into half time with a 1-0 lead, only to go down in the 90th minute after Lee Johnson’s substitutions had changed the game. This Bristol City side has a high proportion of tall players, posing a serious aerial threat. Knowing that Paul Cook had changed his team’s shape, reverting to a 3-4-2-1 system, with Cedric Kipre brought back as the third centre half. Gavin Massey was left on the bench for Josh Windass to join Nick Powell behind centre forward Joe Garner. Latics started off well, not being afraid to take the game to the home team. They went into the interval a goal ahead following a prodigious strike from distance by Reece James. The Wigan fans in the John Atyeo Stand were delighted at the half time lead, if somewhat wary of what might follow. Were Latics going to suffer that all-too-familiar second half slump that had let them down in so many away games? But Latics went into the second half in a similar vein, cancelling out the home team’s efforts and carving out opportunities of their own. 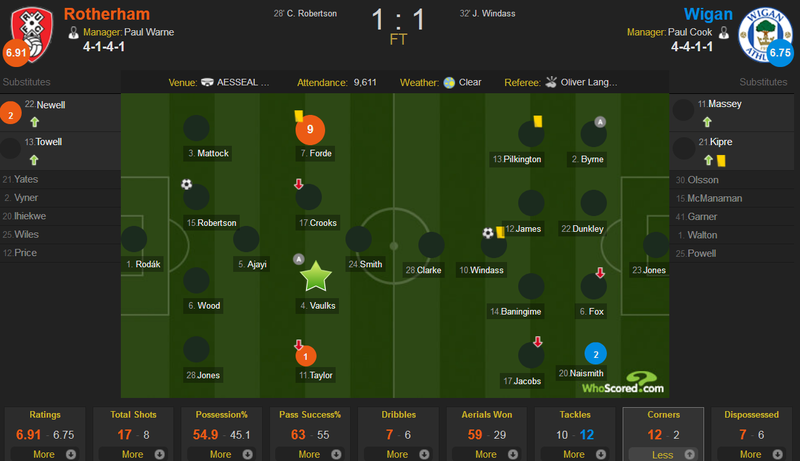 But Johnson once again changed the pattern of the game, through making three substitutions after just 58 minutes. A sloppy Wigan backline allowed goals by Matty Taylor after 65 minutes and substitute Kasey Palmer three minutes later. But Wigan had not caved in and continued to create opportunities. On the 81st minute Cook made three substitutions, taking off Kipre, Windass and Joe Garner to bring on Massey, Anthony Pilkington and Leon Clarke. With just a minute remaining of the five added-on Clarke steamrollered his way through the home defence, his shot being blocked by a defender on the line, only for Pilkington to slot home the loose ball. The away support went into raptures. In the end it was a point well deserved against a good Bristol City side. When Leon Clarke was brought on with some 10 minutes to go it did not go down particularly well with the away following. The big man has had a difficult return to a club where he had previously failed to impress. Joe Garner has established himself as the first choice centre forward and he had had another good game against City’s three towering central defenders. But Clarke’s physical strength and opportunism helped save the day for Latics. Whether the 34-year-old will be at Wigan next season remains to be seen, but Cook will be hoping to see more of his opportunism in the six matches that remain. Faced with such an aerial threat Cook wisely selected three central defenders, allowing Nathan Byrne and Antonee Robinson more freedom to move forward as wing backs. The lineup was well balanced and helped Latics compete on an even keel with a side vying for promotion. Cook’s plans were sadly undone by poor defending, Kipre allowing Taylor to out jump him for the first goal, Chey Dunkley’s slip leading to the second. But the 3-4-2-1 system the manager used in this match could prove to be his preferred formation until the end of the season. Not only does it potentially stiffen the defence but it provides pace up the wings. After being left on the bench presumably because of the formation, Gavin Massey looked to be hobbling along in the closing minutes. Should it prove to be a major injury the manager will be short of his three fastest wingers, since Michael Jacobs and Callum McManaman have already been ruled out. Over the course of the season, faced with injuries to Jacobs and Massey, Cook persisted with players on the wings who were so much less pacy and incisive than that duo. One can only hope that the manager sees the benefit of persisting with a 3-4-2-1 which allows his best available players to take the field in positions to which they are suited. When the second City goal went in there were some away fans asking for Cook to make substitutions. But, despite the defensive errors Latics were playing well against strong opposition. He wisely waited until the 81st minute, changing the shape to his favourite 4-2-3-1. The manager’s substitutions over recent months have often received criticism. He certainly got it right this time. The Championship season is long and relentless, a constant challenge to players who have come up from lower divisions. Chey Dunkley had a mixed game, his slip leading to a goal, fluffing two headers on goal which last season he would probably have put away. But he nevertheless made important tackles and interventions. The 27-year-old Dunkley had just two seasons in league football prior to this season, both in League 1. The ascent to the Championship was always going to pose a challenge. With a young defence around him so often Dunkley has had to shoulder the burden. His heading ability has been so important for the team, as have the superb last-gasp tackles he has so often produced. At times he has been caught out and made errors that have proved costly and his distribution has been far from the level expected from a central defender in the second tier. But at Bristol he rarely launched those hoof-balls that have too often characterized his distribution. Cedric Kipre is only 22-years -old, with a single season behind him in league football, albeit for Motherwell in the SPL. He has a superb physique for a central defender, has pace and passing ability. In recent games he has looked short of confidence, not the player he was earlier in the season. Despite his height and powerful build he is too often beaten in the air, as happened again in this game. Rather than aggressively attacking the ball he can tend to hold back. Earlier in the season Kipre was unafraid to venture forward towards the half way line to make tackles, but playing in a struggling team must have had its effect. Kipre is young and has the potential to become a fine central defender at Championship level. With the right coaching maybe he could go even further? It has been a steep learning curve for both Dunkley and Kipre. Should Latics manage to avoid relegation the knowledge the two have gained from playing at this level will surely hold them in good stead for the future. Hull City sit in 11th place. Their home record is W10 D5 L5, amassing 35 points, just one more than Latics at the DW Stadium. Although Bristol City were flying high prior to playing Latics their home record had not been impressive. In that respect the trip to Hull could pose more of a challenge. However, buoyed by the point gained at Bristol, can Latics come away with a good result in east Yorkshire? Wigan Athletic rarely do well after an international break. But this was by no means a bad performance. Whether it was a point gained or two points lost is the current debate among Latics fans. 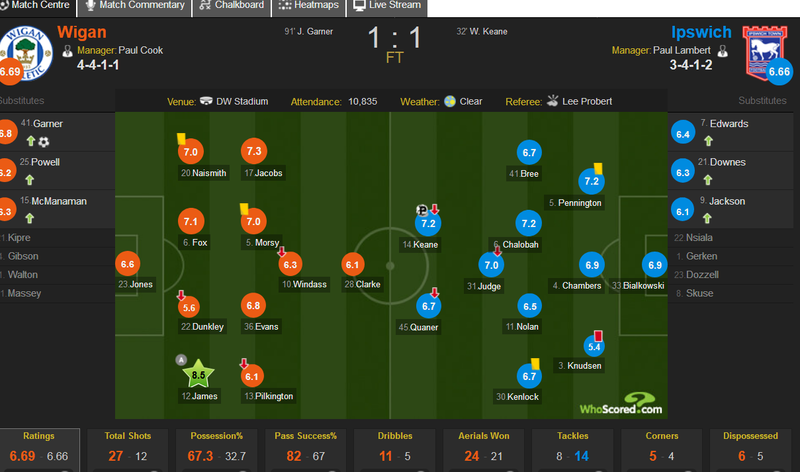 It was a tight game between two teams of contrasting styles with few clear-cut chances created by either side. Brentford played the better football, but Wigan came closest to scoring. With 7 games to play Latics are 4 points ahead of the relegation zone but have some difficult games coming up. Some fans are suggesting that their fate could be decided in that final match of the season when Latics host Millwall. Paul Cook made one change to his starting line-up, preferring the experience of Danny Fox to the youth of Cedric Kipre at centre back. Anthony Pilkington returned to the squad following injury and was brought on after 43 minutes when Michael Jacobs had to go off because of a hamstring injury. Pilkington’s return to action had coincided with Josh Windass being a noticeable omission from the match-day squad. Were Wigan over-physical or were Brentford play-acting? We learned what excellent possession football Brentford can play in the 2-0 defeat at Griffin Park in mid-September. The Bees were riding high at that time and if it had not been for a good display by Christian Walton they would have won by a much greater margin. We saw that smooth possession football in action again yesterday, their three-man backline calm under pressure, the midfield players making themselves constantly available to enable a seamless transition from defence to attack. Brentford are second to Leeds with average possession stats of 57% over the course of the season. They enjoyed 65% of the possession yesterday. 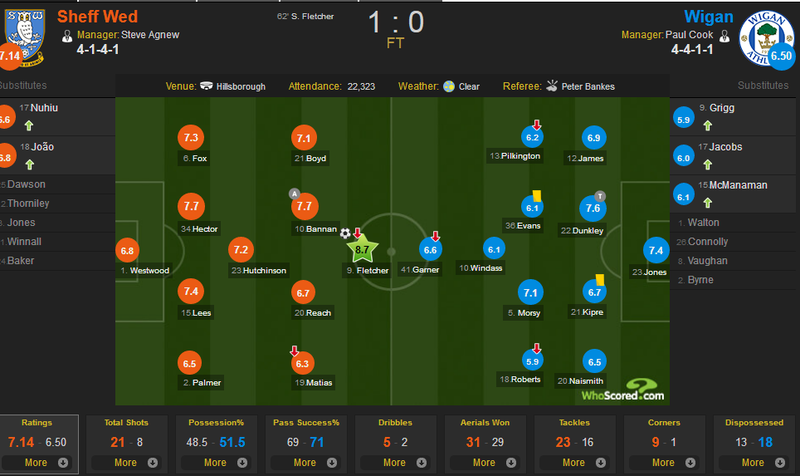 Moreover, their pass accuracy was 82% compared with Wigan’s 63%. A fierce tackle by Danny Fox in the opening minutes on Brentford’s leading goalscorer Neal Maupay was a signal of things to come. The foul count ended up being 19 against Wigan and 14 against Brentford. Wigan’s average foul count is 13 per game. Latics were certainly physical against a team with technically superior players, but although they committed more fouls than usual, they accumulated only one yellow card compared with Brentford’s two. In the encounter at Griffin Park there was criticism by Latics fans of what they considered the home side’s “play-acting” and pressuring the referee. Sam Morsy was sent off in the 60th minute, but his suspension was rescinded by the FA. The Bees’ manager at that time was Dean Smith. When his current side, Aston Villa, visited Wigan in mid-January we saw a similar pattern. Wigan were physical yesterday, but Brentford’s reaction was so often over the top. Is the same behaviour the players learned under Smith being allowed to continue under Frank? So often this season Latics have sagged in the second half. The high pressing has dissipated, and Wigan have dropped back in defence, unable to string passes together. The same happened yesterday. What are the reasons? Are the players lacking in fitness? Or are they following the manager’s instructions? The likelihood is therefore that by half time Latics had expended more energy than their opponents. Given such a scenario it would have been no surprise for Cook to instruct Latics to sit back and look at hitting the visitors on the counterattack. Chey Dunkley returned to form yesterday, forming a combative central defence with Danny Fox. Dunkley’s form off set pieces has been so disappointing this season and he still has not scored a goal. But he came close his header drawing a fine save from the opposition keeper and he later had another effort bounce off the crossbar. That goal must surely come. At times it has been a difficult learning experience for the big central defender in his first season in the second tier, but nevertheless he has figured among Latics’ most consistent performers over the course of the season. Fox’s last appearance for Latics had been in the 2-1 defeat at Derby on March 5 when he went off injured after 33 minutes. He had suffered a previous injury after 25 minutes at Rotherham on February 9 that had kept him out for two weeks. Since signing for Latics at the end of the January transfer window he has made just five appearances, including two curtailed by injury. He was excellent yesterday, his reading of the game and positional sense shining through. He is by no means a sophisticated central defender, but his determination and his passing ability make him a player to be reckoned with at Championship level. Nick Powell was not at his best, but soon after half time he won the ball close to his own penalty box and ran some forty yards to lay off a beautiful pass for Gavin Massey who had intelligently moved into space. Unfortunately, the winger’s effort was well saved by the goalkeeper. Powell is such an important player for Latics that it takes a lot of nervous energy out of us as fans when he looks frail and injury-prone. In this game he misplaced some of his passes, but he was certainly committed and for once Cook did not take him off before the full-time whistle blew. So often have Latics relied on Powell’s creativity to provide some kind of spark in tight encounters. It is a heavy burden he shoulders. With Michael Jacobs once again struck down by a hamstring injury there will be even more pressure on Powell. Pilkington had been brought on for Jacobs, one creative player for another. But the ex-Cardiff player needs more games under his belt before he is going to play at his best. Since joining Latics in early January he has made just six starts with two appearances off the bench. Pilkington has a good pedigree for the second tier and could prove a key asset in the bid to avoid relegation. If Jacobs is to be out for some time Cook will need Pilkington to stay fit and show the kinds of skills that we know he is capable of. Sam Morsy talked in the week about the need for him to cut out the unnecessary yellow cards. After being booked four times in five outings he has now gone four games without a yellow. Morsy is a key player in Wigan’s midfield and Cook will not want to lose him through suspension again. Although Morsy is the leader in yellow cards at the club he is not the only player who has run into problems with referees. Latics average 13 fouls committed per game, with 14 per game being awarded in their favour. They occupy 17th place in the fouls committed table, with seven teams having a higher foul count. However, in terms of yellow and red cards only Nottingham Forest have a worse record. Latics have 82 yellows and 3 reds in 39 games. Antonee Robinson deservedly received a yellow card yesterday for a desperation tackle but his teammates managed to avoid one. Last week against Bolton nobody on Wigan’s team received a card. It appears that Cook and his coaches have been working with the players on improving their discipline. Discipline tends to be associated with the gap between fouls committed and cards received, but it can have a wider meaning. With a young defence Latics have too often given away free kicks near their penalty box that have caused them problems. Throw-ins have been another problem area with too many routinely given away when the ball could have been kept in play. Doing so has invited further pressure from the opposition. “Safety-first” defending – putting the ball out of play at the slightest hint of danger – was not so often punished in League 1 as it has been in the Championship. In the first half against Bolton we saw the visiting side pepper the home defence with crosses and throw-ins, too often given away by the indiscipline of Wigan’s defence. Fortunately, those same defenders, aided by Bolton’s lack of finishing, managed to keep the visitors out until after half time. It was a truly awful game of football, but the result was one which helped Latics maintain a six-point lead over the Millers in the relegation dog fight. Paul Cook opted to bring back Chey Dunkley in the centre of defence for Cedric Kipre. In the absence of Sam Morsy through suspension and Lee Evans through illness he brought in the on-loan Beni Baningime. Rotherham started aggressively and Latics were under constant pressure. A head injury to Danny Fox after 25 minutes caused him to be replaced by Kipre. Rotherham were playing in a style akin to the Stoke City sides of the Pulis era, a constant stream of crosses being poured into Wigan’s box, aided by the long throw-ins of midfielder Will Vaulks. It was no surprise when big centre half Craig Robertson headed the Millers in front after 28 minutes with Baningwe and Kipre ball watching. But it was a surprise four minutes later when Josh Windass took his chance with aplomb to level the scores. After being outplayed Latics were fortunate to go to the interval on level terms. They had been overwhelmed in midfield and the hoof dominated their play. The second half was scarcely any better, although there were a few isolated moments when Latics did put some football together, making Rotherham’s defence look less self-assured. We have seen some horrible football from Latics away from home this season, but this ranks among the ugliest. Are the defenders playing under orders to hoof the ball away at the smallest hint of danger or is the manager unable to get his players to follow his instructions? Were Rotherham close to being unplayable in the first half? Cook’s comment will surely haunt him for time to come. Rotherham have one of the lowest budgets in the division and their squad lacks quality. Cook is to be commended for openness and honesty in his post-match comments, which so often contrasts to the one-sided, mindless stuff that founts from too many opposition managers. But he shot himself in the foot with this one. Rotherham had a game plan: did Wigan? Rotherham’s game plan was simple, relying on crosses aimed towards the 6 ft 3 in Michael Smith, with the big central defenders coming up for set pieces. On a short and narrow pitch Vaulks’ long throws were akin to corner kicks. Latics in comparison did not seem to have a plan. So often they played into Rotherham’s hands by kicking the ball out of play in their own half, giving Vaulks a pan-full of opportunities to launch his long throws. Moreover, they gave away too many unnecessary free kicks giving Rotherham the opportunity to bring forward their big guns. That Latics came away with a point can be seen as a reflection of a willingness to fight, to dig in when under adversity. Effort has rarely been lacking in away games this season, but a genuine game plan has been seemingly absent. The bottom-line yesterday was that Rotherham did not have the quality to make their pressure count. Latics had a good record against Pulis’ Stoke in the Martinez era. They did not lose any of the eight Premier League games against them. Martinez’ teams always had a plan and the players knew exactly what was expected of them. Aware of the rocket throw-ins of Rory Delap they were careful in possession in their own half, disciplined in their tackling. Even the best of game plans can come unstuck as the game progresses. But it is disturbing to see Latics going into these away games without any obvious game plan other than gritty defence and hoofing upfield or out of play at the slightest danger. Beni Baningime is 20-years-old and has had one Premier League start and seven substitute appearances for Everton. His first game in the Championship was a baptism of fire. Baningime looked lost for most of the game, unable to stamp his mark on the play. It was only in the final quarter that he showed the confidence to seek out the ball. His prior experience did not prepare him for this rough-and-tumble occasion. Only time will tell if Baningime will succeed in his half season at Wigan and make a better impression than previous loan players from Everton have made in recent years. Cook was unfortunate to lose the experienced and physically more imposing Lee Evans prior to the game. Moreover, he did not have a central midfielder on the bench to replace Baningime if he had wanted to. Neither Shaun MacDonald nor Darron Gibson were in the squad. The latter has been off form of late, but why Cook did not opt for MacDonald’s experience in a tough fixture like that is hard to fathom. When will Olsson be ready? It was a surprise to see Jonas Olsson on the bench since the last time he played was for Djuurgardens on November 11. Was some thought given by Cook in bringing on the 6 ft 5 in Swede to counter the aerial threat of Michael Smith? Olsson will be 36 on March 10, but John Terry was playing for Aston Villa last season at 37. In the event Cook chose to bring on Cedric Kipre who looked solid in defence with Chey Dunkley. However, Fox’s early departure surely had an effect on the football Wigan played. Fox has the skill and confidence to start moves from the back and he adds calm to the defence. Earlier in the season Kipre showed decent passing skills for a big centre half, but yesterday like Dunkley he so often chose to hoof the ball away. Again, the two had opportunities from set pieces which they could not convert. Last season Dunkley scored 7 goals for Latics and Kipre one for Motherwell. One wonders what position Latics would be in now if either had put away some of the chances they have had over these past months. Kal Naismith had a hard time with Rotherham’s Jon Taylor yesterday and Cook surely needs to take another look at the left back position. Will Antonee Robinson be played there against Stoke on Wednesday? Or will Olsson be brought in to central defence with Fox moving to left back? Creative and skilful players like Michael Jacobs, Gavin Massey and Anthony Pilkington can stretch any Championship defence. They played at Rotherham but were largely wasted with the ball by-passing them so often. However, with the prospect of Nick Powell returning on Wednesday will we see a change in approach from the manager? Cook has good players at his disposal but to get the best out of them he needs to insist on keeping the ball on the ground much more. Latics are ill-suited to a long ball approach yet they have continued with it despite the poor results. Can Cook get his team’s head straight to strike a reasonable balance between possession football and a more direct approach? The jury remains out on this one. Following the uplifting display against Aston Villa we witnessed another depressing performance at Hillsborough. Two poor teams offered little by the way of entertainment, although the conditions did not make things easy for either side. The game was decided by an excellent strike by Wednesday centre forward Steven Fletcher, aided by a lack of challenge from the Wigan midfield. But the home side were deserved winners, having eight shots on target compared with one from a toothless Latics outfit. Paul Cook had named an unchanged side. Latics started positively but they were reluctant to push men forward to support the lone striker, Joe Garner. The high tempo, high pressing game that we saw against Villa was not evident. It was the home side who posed the greater goal threat and Jamie Jones was much the busier keeper. Wednesday could well have scored had it not been for superb last-ditch tackles from Chey Dunkley and Cedric Kipre and good goalkeeping by Jones. But Latics managed to keep it at 0-0 when the teams marched off to the half time interval. The second half revealed that depressing type of play that has been so often the norm in recent months. The “hoof” was very much prevalent, and Wigan struggled to do anything constructive with the ball. After Fletcher’s goal in the 62nd minute one hoped for a riposte from Wigan, but nothing resulted. If another goal was to come in the game, it would most likely be the home team that scored it. But for an excellent display by Jamie Jones the scoreline would have been quite different. Although it is the keeper’s first season in the Championship at the age of 29, he looks far from overawed. In fact, he seems to be relishing it. Again, he was assertive in his box, making some fine saves. Moreover, as soon as he catches a ball, he is quick to step forward, looking for a quick throw to a player in space. Sadly, yesterday there were too few of his teammates moving to make themselves available to receive the ball. Far too often the keeper had to kick long, typically resulting in lost possession. A product of the Everton youth system Jones joined Leyton Orient as a 19-year-old, spending 6 seasons there, making 161 league appearances. After letting his contract run down at the O’s he joined Preston as a free agent in July 2014. During his two years at Preston he made 14 league appearances, with another 34 on loan at Colchester, Coventry and Rochdale. Jones joined Stevenage in January 2016 and went on to make 53 appearances for them in League 2 before joining Latics as a free agent in August 2017. Rather than play side by side in central midfield Lee Evans and Sam Morsy were given different roles. Evans was put in front of the back four with Morsy pushed further forward. Then midway through the first half Gary Roberts was moved from the left wing to play an inside left position. Josh Windass was moved to the wing. The net result was Evans being swamped by the heavily populated home midfield, with Morsy and Roberts able to create few openings going forward. Windass had played one of his better games against Villa in a mobile number 10 role, but the switch saw him consigned to the wing where he rarely plays his best. The lack of midfield cover was plain to see in Fletcher’s goal. What on earth was Cook trying to achieve? Wednesday playmaker Barry Bannan had the freedom of the park. What happens at half time? Despite not playing particularly well in the first period Latics went in to the interval on level terms. For many teams playing away such a situation could be seen as a springboard to getting a positive result. But in Latics’ case this season it has rarely happened. Based on goals scored in the first half of league games this season Latics would be placed in 16th position with 35 points. However, based on goals scored in the second half they would be 22nd with 26 points. Moreover, in away games Latics’ second half goals place them in 23rd position. Tables provided by Soccerstats.com can be viewed here. Latics were 2-0 up at Swansea after dominating the game in the first half through high tempo, high pressing football. In the second half the intensity just was not there, and the home team came back to level the scores. Like yesterday in the second half Wigan had started employing the hoof. Are the reasons for the disappointing second half performances due to physical reasons? Or are they psychological? Or the result of tactics discussions during the interval? After a fine performance against Aston Villa, where the intensity did not diminish in the second half, we were hoping for something similar yesterday. After making an excellent debut last week Anthony Pilkington had to leave the field of play at half time after turning his ankle over. Cedric Kipre continued to play despite an ankle niggle. But it was Will Grigg’s injury that looked the more serious. The constant media barrage of “Grigg to Sunderland” has been wearing thin with Wigan Athletic supporters. But if Grigg’s injury is as serious as it appeared, he surely will not be leaving this month. Will Grigg remains a favourite of so many Latics fans, though there are those who do not consider him to be a Championship level striker. His season has been riddled with injury, but even when fit he has often been left out of the starting lineup. In the meantime, Devante Cole has returned from his loan spell at Burton Albion after making 6 starts and 7 substitute appearances, scoring 2 goals. If Grigg is out long-term will Cook look for a replacement in the transfer window or will he give Cole the genuine opportunity he was denied in the second half of last season?